Many ignorant people in the world hold on to a false assumption that the Oral Law of the Torah was invented by the Talmudic sages. Without going into all the reasons why it is so absurd and all the proofs for the antiquity of the Oral tradition, I will suffice for now to bring just one very minor proof in this short article. Imagine if a law was discovered in the writings of the Talmudic sages, hailing back to a bygone era – dealing with the property rights of a particular tribe that had been exiled by Assyria in 556 BCE (3205 from Creation)? That is nearly 750 years before the Mishnah –the oldest of rabbinical writings— was put down in writing in 189 CE (3949 from Creation). That fateful year saw the tribe of Naftali, along with its brother Northern Israelite tribes, uprooted by the wicked Assyrian forces of Sanhheriv (Sennacherib). While many tribesmen of Asher, Menashe, and Zevulun returned in body and spirit to rejoin the Jewish People (see Divre HaYamim (Chronicles) II 30:11), we have no written evidence or oral tradition about the Naftalites ever returning home – not before the ultimate ingathering of the exiles at the prophesied ‘End of Days’. In fact, the pre-eminent legal force in the Mishnah is Rabbi Aqivah – who was of the opinion that the ten Northern tribes would never return – not ever. (Mishnah, tractate Sanhedrin 10:3). 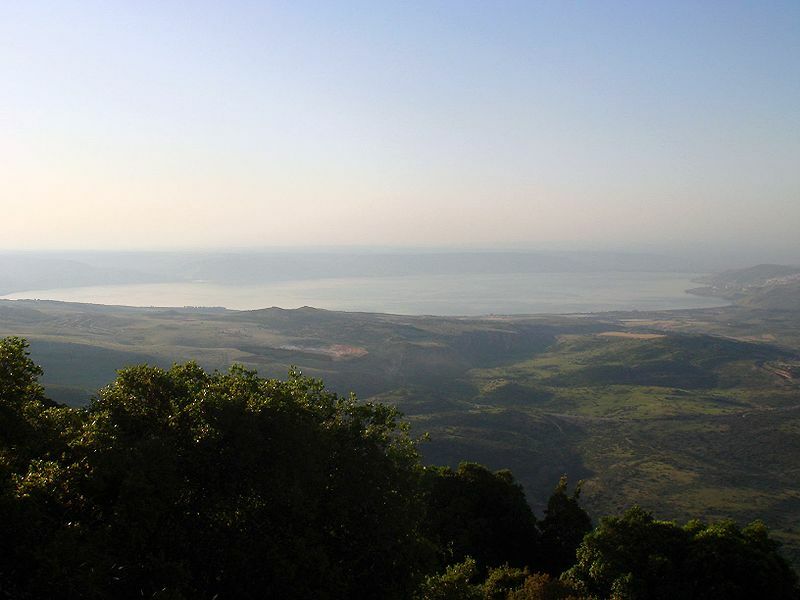 Yet, incredibly, the rabbis maintained the ancient law that upheld the exclusive fishing rights of the tribe of Naftali at the Sea of Galilee (known in Hebrew as ‘Yam Kinnereth’, ‘Yam `Tiveriah’, and ‘Yam Ginosar’) – even along the southern shore of the small sea. The [other] tribes may not harvest fish from the sea of Tiberius because it belongs to Naftali. Furthermore, they are given the strip [of land] on the southern shore of the sea, as it is written [Deut. 33:23] “possess thou the sea and the south” – the words of Rabbi Yose HaGelili. וְכֵן הִתְנָה שֶׁיִּהְיֶה כָּל אָדָם מֻתָּר לָצוּד דָּגִים מִיָּם טְבֶרְיָה: וְהוּא, שֶׁיָּצוּד בְּחַכָּה בִּלְבָד; אֲבָל לֹא יִפְרֹשׂ קֶלַע וְיַעְמִיד סְפִינָה שָׁם, אֵלָא בְּנֵי הַשֵּׁבֶט שֶׁהִגִּיעַ אוֹתוֹ הַיָּם בְּחֶלְקָם. Likewise he legislated that any man may harvest fish in the Sea of Tiberius. But that is on condition that one fish with a pole only; however, one may neither cast a net, nor station a boat there – except for members of the tribe in whose inheritance the Sea came. — Mishneh Torah, Hilkhoth Neziqe Mamon (Laws of Monetary Damages) 5:8: (Compiled between 1170-1180 CE by Rav Moshe ben Maimon – RaMBaM. Here is the law as it was ultimately codified). We find this law in Mishneh Torah as practical law on the issue to this day. Although there is no one to enforce it, it remains ‘halakhah’ (Jewish law) even in our times, for all those who desire to fish the waters of the small inland sea… It is no less binding than later rabbinical prohibitions which were decreed by the great Sanhedrin throughout the ages, such as the laws of `eruv (from the times of King Solomon and his Court — see Mishneh Torah, Laws of `Eruvin 1:2) and the well-known rabbinical additions to Israel’s kashruth-dietary laws – many of which are also of great antiquity. Who would zealously preserve the property laws of a long-exiled Israelite tribe – a tribe believed by the greatest of the rabbis of the Mishnah would never return?! Is this the mark of “Johnny-come-latelies”, of inventors, of revolutionaries?! Heaven-forbid. This and many other proofs reveal that the rabbis of the Talmud received from their forebears, preserved, and passed forward legal traditions as old as the Torah itself – an Oral tradition that accompanied the Written Word from the time it was given to the nation by HaShem at Sinai. This entry was posted on Thursday, October 29th, 2009 at 1:50 pm	and is filed under Torath Emeth--A Torah of Truth, Torath haGolim (Torah of the Exiled). You can follow any responses to this entry through the RSS 2.0 feed. You can leave a response, or trackback from your own site. Is it truth, then, that the rest of the Assyrian-exiled tribes of the northern Israelite kingdom will never return? Only HaShem can Know. However, it is not so simple. Note that Rabi Eli`ezer disagrees with Rabi `Aqivah (Sanhedrin 10:3). In light the above, there can be little doubt Rabi `Aqivah recognized that the tribes would be represented in the future Israel (as is clearly described in Yehhezqel). For that, their descendants would have to return home from the exile… However, they would not have the merit to return as proud, individual tribes, but as an unsorted mix as Jews are today, that would one day be sorted out in Messianic times. Do you have another understanding? We’d be glad to hear. I wouldn’t say I have an “understanding”, but I do have questions. Couldn’t it also be said that Yehhezqel 37 talks of “Efraim” being placed upon Yehudha in order to be returned back into benei Yisrael? Would this also go along with Zekharyah 8:23? And would things like the return of [some of?] benei Menashe be indicative of such a thing? do the samaritans who claim roots of menashe and efraim play a part in this.